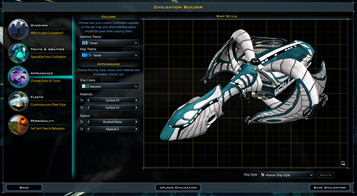 Galactic Civilizations games have had ship building in them for almost 20 years. And ever since, people have used it to create all kinds of amazing designs from robots to their favorite Sci-Fi ships. 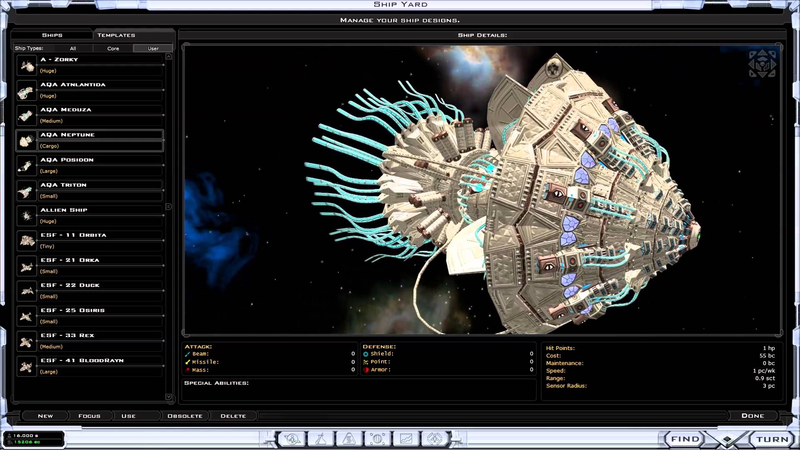 With Galactic Civilizations III, players were able to share their designs with millions of other players via Steam Workshop. 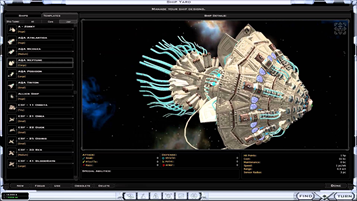 Suddenly, players could download and play with almost any type of ship imaginable. 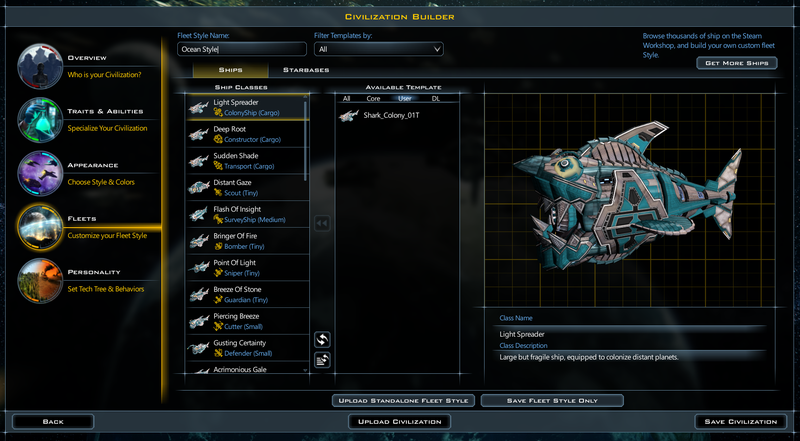 As much as players loved being able to design and share their ship designs, there was one thing they kept requesting over and over: the ability to assign ship designs to a Civilization and have them use it. This way, if they wanted to create a race of giant robots, they could. Or if they wanted to play their favorite sci-fi race (or play against it) they could. 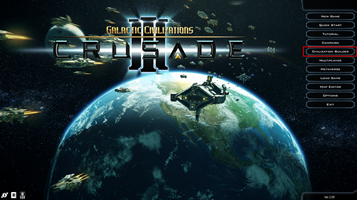 In Galactic Civilizations III: Crusade their wish is fulfilled! First, video. Paul Boyer and I sat down with the Civ Builder the other day. I wanted to show off the laser space sharks and aquatic race we built. Check out this exclusive video to see what we created. 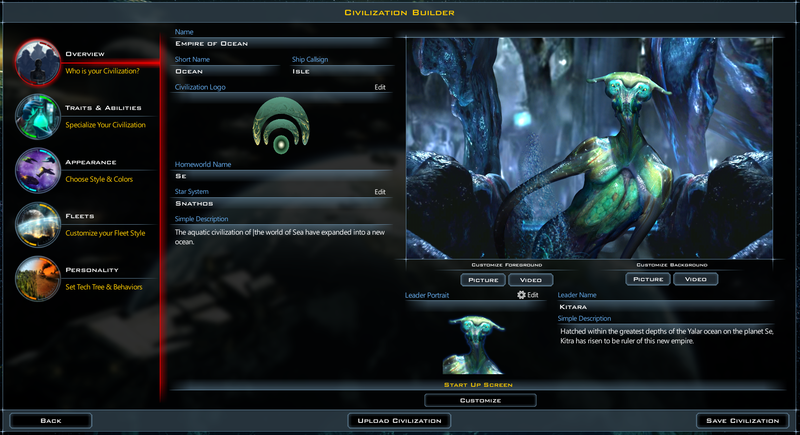 Now, let's walk through the new Civilization Builder, screen by screen. 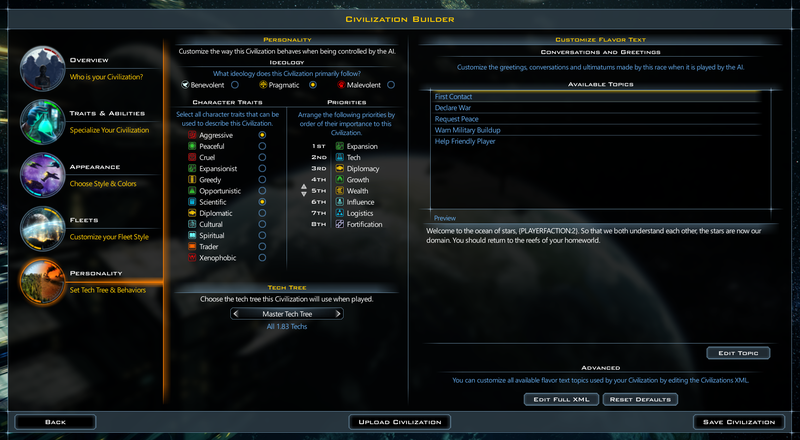 From the main menu there is a new button - Civilization Builder. The Civ Builder exists outside the game. Once inside, the player is greeted with a series of screens that lets them configure a completely new civilization. With the Steam Workshop, you can download new logos, alien portraits, alien backgrounds, alien images, etc. Players can put together a completely new alien race using assets shared by other users. Once you have decided what your alien civilization looks like, you can move on to what their strengths and weaknesses are. The trait screen lets you assign the civilization various strengths and weaknesses. Many of these abilities give them unique gameplay features. From there, you can decide what their ships will look like. There are dozens of different color combos you can play with, along with a host of different textures and materials. You can give your ship style a gritty, beat up look or a...well, completely outrageous look. Once you finish deciding what visual style your ships will have, you can move on to assigning ship designs to each class of ship. 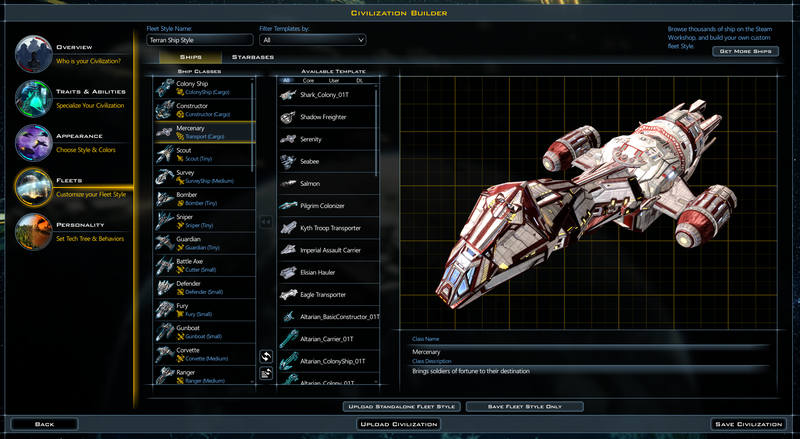 Here you can assign a ship design to all of the auto-generated ships which is what the AI will use as well. Here, you control every default ship in the game. In the above example, I have assigned my colony ship to be a giant robot fish because...of course! But let's say you don't like the choices we provide (and yes, we're going to include giant robot fish). 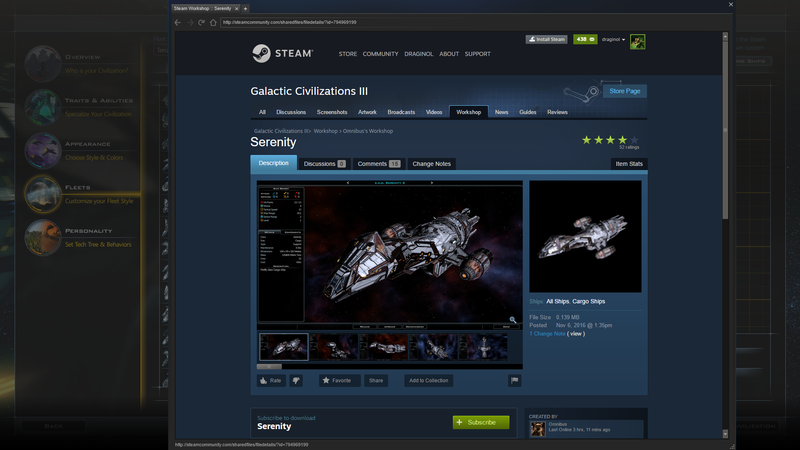 You can click a button and go onto Steam and browse the tens of thousands of ship designs that have been made by players already. Fans have created virtually every kind of ship you can imagine. Picking a cool ship design, it is instantly in the game. 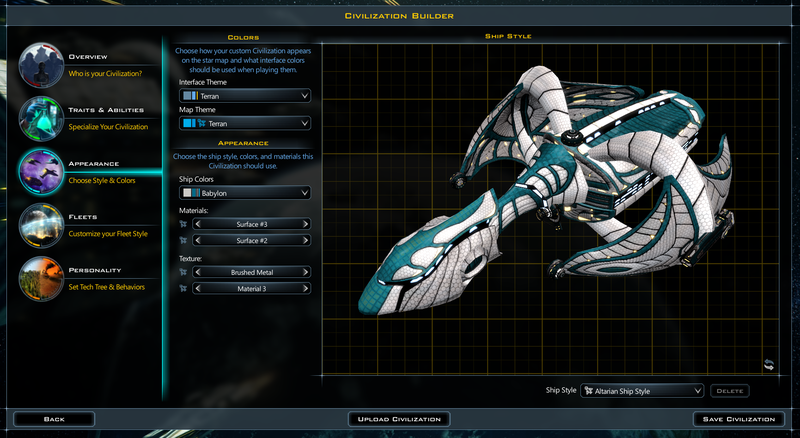 The GalCiv ship designer is essentially a giant set of blocks that you can use to create anything. 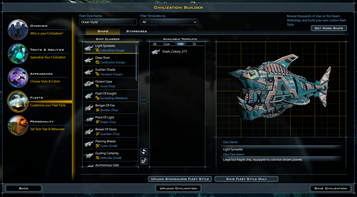 For the past two years, players have been busy making lots of ships. Downloaded ship design is mixed with the color and materials chosen earlier. This is then repeated for each of the ship categories in the game. Next up, players will want to give their civilization some personality. On the Personality screen, players can decide how the AI will use this player. They can also set up what the AI will say in various common scenarios. If that's not enough, the player can directly access that civilization's XML file to go crazy with how they will react in different situations. Once you are done, you can save your Civilization and even upload it to Steam (if you use other people's designs, we ask that you get their permission). 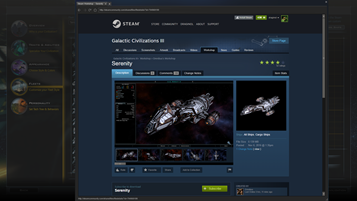 Once uploaded to Steam, other players can download the entire civilization, ships and all, in a single click and play as that civilization or play against them. My Fish Civilization in game. They're hungry! Galactic Civilizations III: Crusade will be released in Spring of 2017 on Steam and GOG. You can follow it on Steam by going to its Steam page. Cool! I want I want... So, we get this tomorrow, right? The Thalans already it and have travelled back in time to provide THEIR feedback. Does it also allow tho change mercenary ships that have some kind of special ability (like scouts immune to pirates, effects to planets etc.)? In the fleet selection, can you change the class name and description? 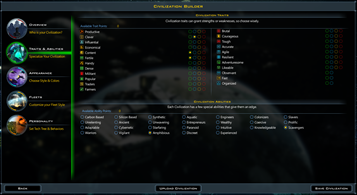 Any plans to finally make the ship designer accessible from the main menu as well or accessible through the civ builder? Didn't show any custom tech trees. Is there a built in tree editor or do you still have to create your own and then select it? What you do is a step into the right direction, but how can you leave out a custom tech tree??? It works the same way like the other tools: You make a set of the neccessary tech tiles and then you give attitudes to them and let the players choose whether it shall be a syntethic, a economic or a military orientated tech direction. You already do that with the specialisations, which is a good step. But even if it has not more function, the people dream of setting it up by themselves. Or not? Of course, lets be happy with the existing tech trees until then. It is just missing a lot in the shape of having 'uniqueness' in the own faction, even though its just a small touch. You know what I mean? RE: racial traits, I can't wait to see how Carbon-based and Silicon-based work. Or synthetic and cybernetic. Should be interesting since you have to be one of the four... (well, carbon, silicon, or cybernetic). And, given the number of girlie-picture factions on Steam, maybe one of the options should be "Silicone..."
Really looking forward to Crusade! Spring 2017 starts March 20...any chance we'll get to enjoy it at 12:01 am that day? Also really enjoyed watching the YouTube video today. I miss these. Twitch is okay but I'm never available to watch them. Haven't been too many YouTube videos of late but I suppose everyone at Stardock has been busy designing, iterating, and creating. Truly enjoy your hard work! I find "carbon based" a bit confusing. 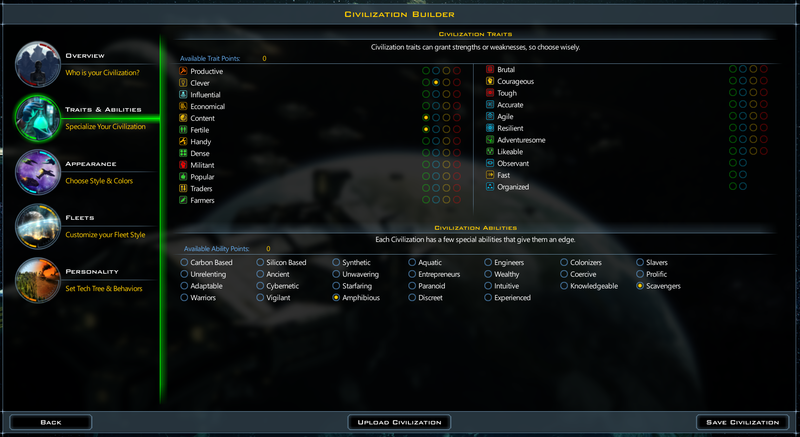 Aren't most species in Galciv carbon based? Now it seems weird not to include it on almost every faction I make. Is there any chance we will be able to see how the custom tech trees work? Creating my own tech trees from the custom faction would be nice. I believe founders get beta access. Allow folks to select/de-select what races can appear at random from the races they have. Even allow the standard races to be de-selected. Well this is all a step in the right direction. I'd recommend adding a color palette editor first and foremost, then give us like 20 more home systems of varying genericness (be nice to have an editor, but there is only so much time in a day). Those two, I think would make this civ editor really above and beyond. Custom tech trees are nice too, but I see those as secondary, since they have a lot more balance implications and possible issues. I think for sharing civs, the color palette and more home systems is more important. This I am very much looking forward to. I enjoy playing with the ship builder but am not very good at it but this is more my level. I really like what I see, overall. Will this output a single faction file similar to what is already output? If so, could you not make an option to save as a folder with all the XML for ease of modding? Also, I find it unfortunate that the home system drop-down menu only locates systems from the base StarSystemDefs.xml file under the InternalName "FactionStart"... could you make it so this menu displays all Star Systems? Again--what I see is a huge step in the right direction. But ultimately, it still lacks some of the elements that make this usable for most of what I want to do. I understand that you don't have time to do everything everyone wants--but if you could make the faction file usable by modders, these steps would greatly streamline the process of creating custom factions that use custom tech trees, improvements, abilities, etc. Thanks again for all the hard work--and for the update! Maybe just allow us to pop in the .xml ourselves? That might be enough. I have home systems with special stars/ planets. Wouldn't be hard to just "drop in." Otherwise I'm going to want to put most of my factions on Nexus, where I can include all of the extras. Perfect! I cannot wait for this to come out. This is close to the perfect 4x game, if everything works out as good as it looks and sounds. I can't wait for citizens. I used to play Distant Worlds and the concept reminds me of that. 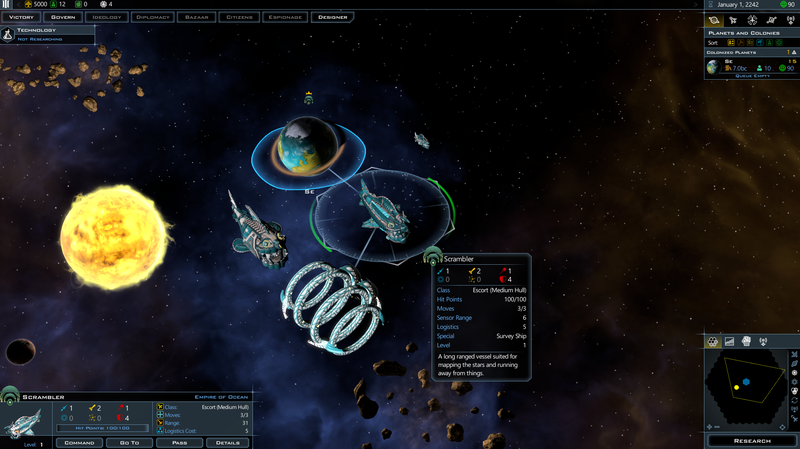 The only major things GalCiv still lacks is: gameplay and control of the ship in the battles mode - where players could control their ships movement (as part of a group of ships) and firing of weapons (this would introduce an element of strategy into the battles which they sorely lack now since they are won and lost through technology alone). The other thing I would love to see eventually but might be more complicated to do is default story settings for diplomacy so you could put civilizations on a story arc and have that story determine some of the responses to other civilizations. People have posted before that alliances should mean alliances so I hope some of these issues will be remedied at some time. Great work Stardock. Truly might be the best 4x game of all time. I find "carbon based" a bit confusing. 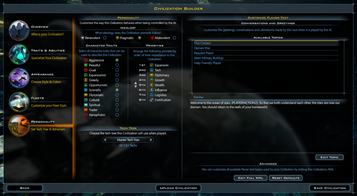 Aren't most species in Galciv carbon based? I am assuming that the screen they showed us was an early version. As I said before, the chemistry-based 'abilities' are actually necessary, and are mutually exclusive. They really need a slider-type interface, or at least to list the chemistry separately so you don't have to use up an ability when you choose one. And yes, most species in the game are carbon-based. However, some of us have made silicon-based factions, and it would be nice to include those. An example of where this might be important would be a scenario in which silicon-based life was trying to colonize a carbon-based world. Colonizing a planet with a carbon-based biota could result in competition, with the carbon-based life having a home-team advantage advantage because carbon is more versatile due to the greater number of polymers that can be made with it. 'Plants' (producers in ecology-speak) require other organisms (e.g., fungal symbiotes), and these would not be present on the colony, requiring the silicon-based species to grow a whole new ecosystem just to support crops. On the other hand, it seems unlikely that carbon-based pathogens would be able to affect in the other, meaning that the silicon-based life might be immune to any pathogens they didn't bring with them. Species chemistry and the option to have a species be fully aquatic should really improve faction variety, and make the game more fun! Re editing appearances: it would be cool if there are some more color schemes included. Dunno how other players feel about it, but right now I think there are so much shiny, very bright, high contrast color combinations, but not enough toned down or even darkish themes (like ocean, bloodstone etc. - which are quite cool IMO but too rare). I'd love that--and that sure seems like something that the devs could do--I was trying to suggest something that would take, I think, virtually no effort since they'd likely only have to change the internal name that the civ builder looks for when making this list (in my mind, anyway--though it certainly may be more complicated than that). My impression is that many of the features demonstrated in these diaries are pretty far along--and so I don't expect major revamps. At the same time, I think conversations like this are good in that they reveal what is desired of the game from the players' perspectives. I do hope (and have confidence) that the devs are paying attention and will try to implement the ideas that will make this game even more awesome.